Focus on Top 15 Global Sustainable companies. 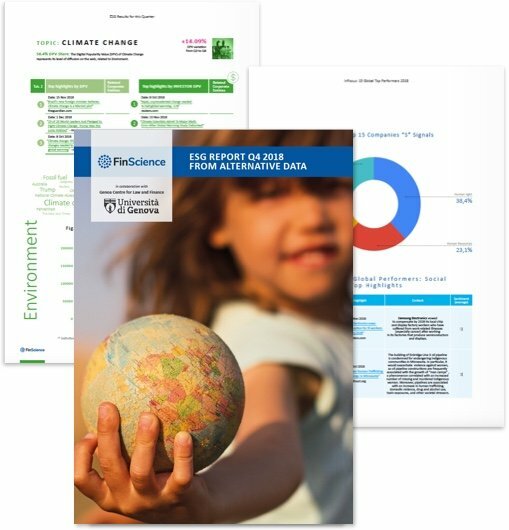 FINSCIENCE'S RESOURCES in the ESG area. 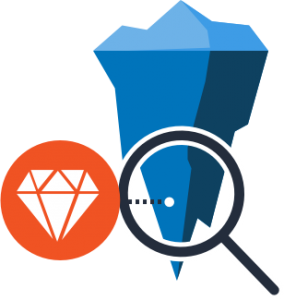 Guide, Reports and Alternative Data Intelligence software solutions implemented with non-traditional digital data sources and Artificial Intelligence, useful for an ESG assesment from an alternative perspective. 4 Quarterly Reports – annual subscription. Some studies within the finance literature have shown evidence of higher and less risky returns for those who invest in companies having an outstanding ESG profile. This is one of the reasons why companies, institutional investors, consulting firms and publishers are increasingly aiming for the acquisition of structured, comparable, and meaningful ESG information. The analysis of big data, and first of all data coming from Alternative sources, is becoming an integral part of the investment activities, and should not be limited to the integration of corporate financial data but should also include the monitoring of companies’ ESG performances. Investors should be able to identify the most relevant issues and future risks and decide how to address resources in a sustainable way. The use of real-time information on digital perception related to corporate sustainability issues is an paramount step for the integration of ESG assessments, which today are usually based only on corporate narratives and, therefore, subject to the risk of ‘greenwashing’ mechanisms. By using external sources of information investors can better verify companies’ internal communications. The aim of FinScience and Genoa Centre for Law and Finance of the University of Genoa is to expand the investor information and allow companies to verify the impact of sharing their ESG principles with the key market players. 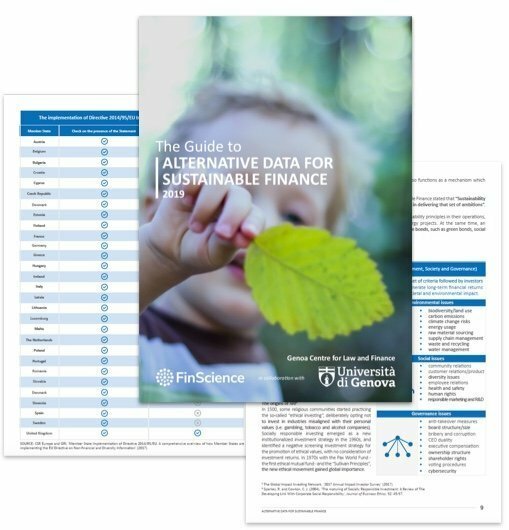 Built on FinScience’s AI platform, which works with Machine Learning, we have developed Guide, quarterly Reports and Alternative Data Intelligence software to provide useful tools for a better understanding of how the new sustainability topics are developing and changing the global financial strategies. The aim of FinScience and of the Centre for Law and Finance of the University of Genoa is to expand the set of information available to investors and allow companies to verify the impact of sharing their ESG policies with the key market players. 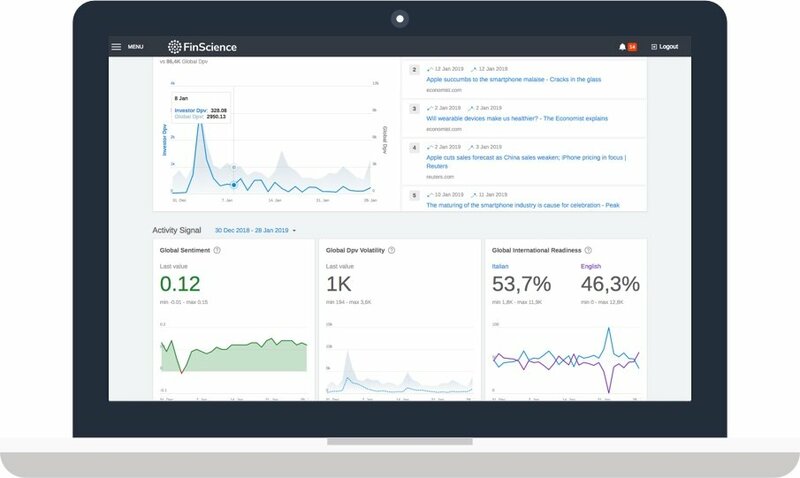 Built on FinScience’s AI machine-learning led platform, we have developed Guides, quarterly Reports and an Alternative Data Intelligence software with the aim of providing providing useful tools for a better understanding of how the new sustainability topics are developing and impacting the global financial strategies. 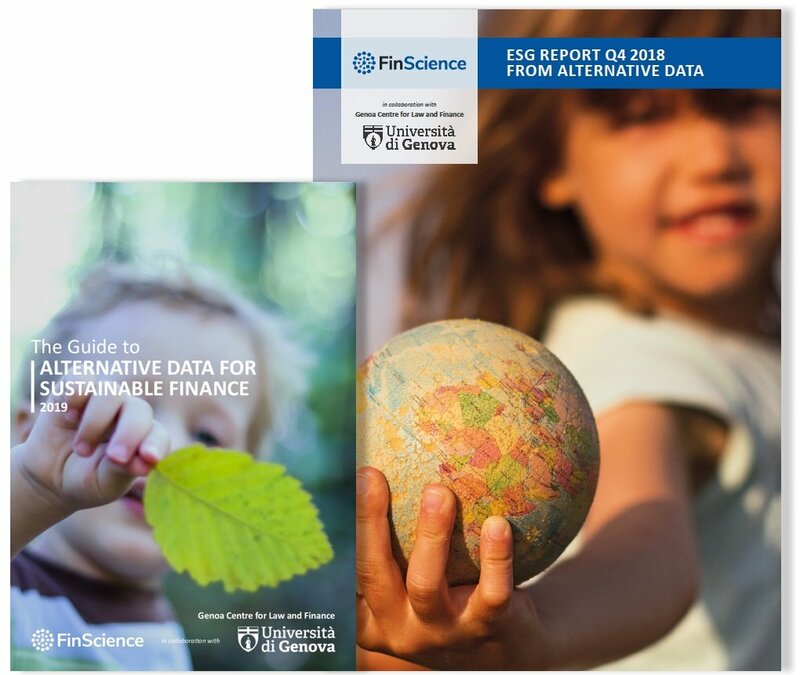 The Guide is the user manual to Alternative Data for Sustainable Finance and tells you how to read and interpret quarterly Reports, indices and alternative scoring systems for ESG. The quarterly Reports help to identify new ESG trends, reputational and litigation-related risks, as much as to integrate corporate traditional internal data. Environmental, social and governance issues are constantly monitored through the analysis of Digital Popularity Value (DPV), Investor DPV and DPV Volatility in order to detect variations in public perception and sensitibity in a three-month period. The study is also on relevant corporate events, entities and top publishers for each ESG sector. The Reports include a focus on Top 15 Global Sustainable companies. The Alternative Data Intelligence software let you monitor and analyse in more depth and in real time ESG trends, topics, signals and indicators through a simplified dashboard. FinScience is a data-driven fintech company founded in 2017 by Google’s former senior managers and Alternative Data experts, who have combined their digital and financial expertise. FinScience, thus, originates from this merger of the world of Finance and the world of Data Science. FinScience is the only Italian one selected by siliconrepublic.com among the 25 European deep-tech start-ups to watch in 2019. FinScience is part of Datrix group.